This is an online slot played on 5 reels and 3 rows, featuring an RTP of 95%, and twenty paylines. This is a classic slot game from Barcrest, known for its ‘Road to Riches’, ‘Wishing Well’ and ‘Pots of Gold’ bonuses, all themed around the luck of the Irish. UK Slot Games is proud to host Rainbow Riches, along with over 600 slot games, including ‘Starburst’, ‘Rainbow Riches’, ‘Fluffy Favourites’ and ‘Wolf Gold’. There are thousands of online slots out there in the gaming world, and only a select few go on to become legends of the genre. Rainbow Riches is definitely one of those legends. Everybody who’s played online slots for any length of time is aware of Rainbow Riches, and most of those people have also played it. It has a large and devoted fan base. Perhaps because the Irish mythology is associated with luck, there are a surprising number of slot games which take the themes and legends of Ireland and use them as a theme. No game has done that more successfully than Rainbow Riches, which has spawned a number of sequels. You’ll understand the inspiration for this game the moment you load it up to play it for the first time; the almost-garish display of brightly coloured reels, along with the rainbow in the background, set the tone. A moment later you’ll see the leprechauns, and you’ll know instinctively that you’re going to be looking for the pot of gold that’s been hidden at the end of that rainbow. Lucky players will be able to raid that pot and turn it into winnings! Barcrest, the company who made Rainbow Riches, have been making slot games in both online and physical formats for decades. They started off making physical fruit machines for casinos and pubs, and it shows in the way they put their games together. There’s a very traditional, old-school feel to Rainbow Riches which appeals to the older generation, as well as containing enough modern, online features to attract the younger end of the market. Nowhere does the old-school feel come across more than in the bonus features, which we’ll get to later. In keeping with both the theme and the traditions, the symbols in this game are the standard 10, J, Q, K and A, along with the Rainbow Riches logo, and a gold coin which acts as the wild. 1. Scatter: Road to Riches will take you all the way back to playing physical fruit machines in a bar or arcade - if you’re old enough to remember those days! To trigger this bonus mode, you’ll be looking to find three leprechaun scatter symbols. It doesn’t matter where they appear on the reels; they all count. Successfully finding the leprechauns takes you to a whole new game screen, which displays a path full of multipliers (some small, some large), and a classic-style wheel of fortune. That’s when the equivalent of a dice game starts! Click ‘spin’ and the wheel will give you either a number between one and six, or land on ‘collect’. Any of the numbers will allow you to take that many paces along the road, and the further along the road you go, the more the multipliers are worth. ‘Collect’ ends the bonus game, and gives you a reward of whichever the last number you landed on was, which is then multiplied against your total bet. 2. Wishing Well: Wishing Well is another bonus feature that’s activated by finding the right symbols. In this case, as you may have guessed, you’re looking out for the wishing wells! Again, it doesn’t matter where they are on the reels so long as you have three of them at the same time. You have a free choice of any of the wells, and there’s a multiplier hiding behind each one. Obviously, they will all contain different value and some are worth more than others, but the plus is that there’s no nasty trick here; you’ll definitely get a multiplier, no matter which option you choose, and that multiplier will be added to your stake. 2. Pots of Gold: Pots of Gold are what everyone really wants when they go chasing the end of a rainbow, and Rainbow Riches doesn’t disappoint players who go searching for it here. This is a little more specific in terms of there the symbols can land; they have to be on the second, third and fourth slot. Get that right, and you’ll be whisked away to another bonus game screen, where you’ll find a leprechaun standing on a rock. Spinning around his head are no less than twelve different pots. Whichever one stops spinning at the bottom of the screen above your selection arrow is the one you get to look inside. As with the other bonus games, this is a multiplier, and it will be applied to your total bet. By this point, ‘Barcrest’ just exists as a brand name. They were long since bought out by SG Gaming, who own and operate all the Barcrest titles and still use the name occasionally when they’re launching games with the traditional market in mind. The history of Barcrest can be traced all the way back to 1968. Over the course of the decade that followed, they arguably established themselves as the biggest physical slot games manufacturer in Europe, supplying bars and casinos across the UK and the continent. When times changed, and it became clear that the future of slot gaming was online, Barcrest changed with the times and struck gold (if you’ll excuse the pun) with the creation of Rainbow Riches in 2006. Five years later, they were acquired by the Scientific Games Corporation, who are now more commonly known as SG Gaming; who could be more accurately described as a union between Barcrest and another gaming firm called The Global Draw. Many of the strategy and design staff from Barcrest were kept on, meaning the same talent pool could be called upon to make new games. SG Gaming is now a huge company, comprising of over 500 full time staff split across offices in Manchester and London. They manufacture both hardware and software, combining terminals and content with systems and support, and in that way consider themselves to be a ‘one stop shop’ when it comes to online slots and physical slots to all of their customers. The mention of the software and servers tells you a lot about the direction of the company, and the fact that they consider themselves to be more than just a conventional online slot creator, but there’s still a sense of pride which they’re more than entitled to. 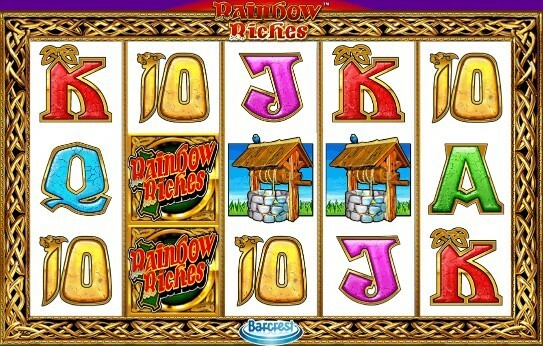 The Rainbow Riches franchise is the envy of almost every other slot game developer in the world. Rainbow Riches isn’t just a game, it’s a franchise. It has spawned sequels, sequels to those sequels, alternate takes on the theme and a whole family of games based around the original, all of which are officially licensed descendants of the original game. Whilst we’re here to talk about the very first game, which is full of charm and every bit as much worth playing today as it was in 2006, we thought it would be helpful to let you know what the rest of the Rainbow Riches brand has to offer, too. This was the first sequel to the original game, and was released in 2016. There was quite a gap between the first game and the ones that followed; probably because the manufacturers were waiting for the market to develop. Nobody ever accused the original game of being short on bonus features, but this one adds even more to the selection. You can’t play them all at once; you select three from five before the game starts. The original three are all still there, but added to them is a free spins bonus (which was lacking in the first game), a ‘Magic Toadstool’ bonus which is a standard ‘pick a prize’ game, and a ‘Cash Crop’ game triggered by finding three of those leprechauns again. Again, this involves winning prizes based on the values of coins that then appear on screen. There’s also a ‘Big Bet’ feature which invites players who are happy to bet a little extra to speculate and accumulate on three extra wheels. With Big Bet mode enabled the RTP is 98%, whereas the regular game offers 96%. There are many, many extra ways to win money with this game compared to the original, and for that reason some players might find it a little too cluttered and confusing. This isn’t, strictly speaking, a slot game at all. It’s closer to a video game which you can win money from, using the look, feel and characters of the Rainbow Riches world to appeal to existing Rainbow Riches players. Each bet gives you five jumps; you can think of them as spins; which allow your on-screen leprechaun to move from one platform to the next, collecting rewards as he goes and trying to avoid objects which will end the game. It’s like an old-school platform game with money on the line. Having waited a decade for a sequel to Rainbow Riches, three then arrived within one year! 2016 was a great time to be alive for fans of the franchise. This variation of the game offers 100 paylines, split over two sets of five reels, which makes for a packed-out playing area. A staggering seven separate bonus features are on offer, along with the Big Bet feature that first appeared in Rainbow Riches Pick ‘n’ Mix. 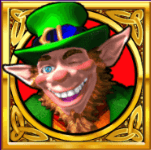 As well as looking out for a leprechaun, you’ll also want to attract the attention of a purple fairy, who can offer you multipliers, free spins, or the changing of standard symbols into wilds. Those are some useful magic powers when it comes to trying to find a win! The standard RTP is 94%, a little lower than the original game. The Big Bet boosts this all the way up to 98% which is great, but may not be desirable to people who won’t want to make large wagers. Like the Pick ‘n’ Mix game, this may be a little too complicated for people who just want a simple gaming experience. If the previous sequels to the original game made things complicated, this one looks to make them simple again. 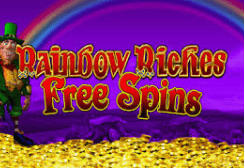 2017’s Rainbow Riches Free Spins offers exactly what it sounds like it should offer; a heavy focus on free spins. In fact, in this version of the game, they’re the only bonus feature the game offers at all! You’re awarded more and more free spins depending on how many of the free spin bonus symbols you can find, and extra bonuses found during those free spins add to your tally, up to a maximum of 999 free spins. You should be able to find a few wins if you max that out! There are only ten paylines, but with fewer symbols and so many spins they should be easy enough to find. This feels very stripped back compared to the other games, and might be a case of taking too many of the bonuses away. This was a 2018 offering in the Rainbow Riches series, and definitely looks to take the game back to basics. It’s best described as a modernising of the original game, with the Big Bet feature added on, and the graphics brought into the modern era. The magic fairy from Slots of Gold is the central bonus feature here alongside the Big Bet; she’ll transform into a random symbol to boost your chances of a win. This time, the Big Bet offers bonuses of £10-£50 depending on what symbols you have on screen when it’s activated, and your stake. As always, it boosts the RTP up to 98%. This game offers higher payouts than the original, but has fewer features to go with it. Another 2018 offering, and another attempt to make the game into something more complex and layered. This game takes the standard five reel, three row format and adds a churning rainbow world of wilds above it, taking the form of gold and silver pots. Land a pot of gold symbol anywhere on the fifth reel and all the pots in the lower section of the rainbow will drop onto the reels and become wilds, which should mean wins for the player. Add in the free spins and the Big Bet feature which we’ve now come to expect as standard, and this is a unique game in the series. Players who want something more cutting edge may be more drawn to this than the original game. Welcome the newest member of the Rainbow Riches family, which arrived in late 2018. With this title, Rainbow Riches finally moves away from five reels and three rows into a five-by-five game, offering up fifty paylines and a maximum bet of £500 per spin. Above the reels are wooden doors full of wilds; find a leprechaun on row one and he’ll open up one of those doors for you, pouring the wilds onto your reels. Free Spins and Big Bet are back again as standard components of the game, with an RTP of 94% up to 97.75% depending upon your stake and the bonus features. This is a cross between Drops of Gold and Fortune Favours, which is much more complex than the original. There are actually two different online slots named ‘Irish Luck’, but the better known one is probably the Eyecon offering. It uses much of the same imagery as Rainbow Riches, but throws in a few pints of beer onto the symbols just to add to the Irish stereotypes it’s already dealing with! There’s even a fairy who can bless the reels and alter the symbols, which will be very familiar to Rainbow Riches fans. With its five reel format and rainbow background, this is very much a clone game. NextGen aren’t going to be left out of the Irish legends theme, either. This is another pretty game which takes on the Irish theme, and also adds some beautiful women to the reels to keep the male players interested. We don’t know if it does the same thing for the women. Pots of gold are what you want to see on the reels; so if you’ve played Rainbow Riches you already know what you’re doing here; and the bonus modes are free spins, and a gamble feature that enables you to wager the total of your previous winnings. The RTP is a decent 95.04%, but it just doesn’t have the depth of features that attract so many people to Rainbow Riches. 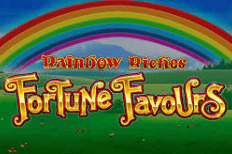 As with many classic games which came out before the mobile gaming industry really found its feet, Rainbow Riches had had to be revisited and especially adapted to make it playable on a mobile. As such, when you go to load the game, you’ll be taken to the mobile version instead of the same game you’d see if you were using a laptop. Nothing is lost in the translation; all the modes are here, the visuals are just as crisp, and the game works just as smoothly. None of the buttons are difficult to locate, and you shouldn’t find yourself squinting to make sure you’re pressing the right controls. A leprechaun even helpfully appears on the loading screen to remind to you turn your phone landscape, which helps a lot with the display. It can be played vertically, but let’s be honest, why would you want to do that? The only thing that’s lost is the brightly coloured background behind the reels, but depending on how you feel about garish backgrounds, you might even consider that a bonus. The game was cited as an example on a football website, to draw attention to the fact that more female players than ever before are logging on to play online slots! It was the ‘Who Ate All The Pies’ website that featured the article. If a slot game that has nothing to do with football can get mentioned in passing on a football website, you know its reputation has spread far and wide. On the flip side, Sky News recently reported that the betting firm Coral recently got in trouble for using the game in their advertising, on the grounds that children might see it and be drawn in by the theme. This is a common criticism that regulators and the media make of any slot game that features cartoonish graphics, disregarding the fact that many adults enjoy cartoons, even more adults enjoy nostalgia, and no betting company in their right mind would spend money advertising to a demographic who can’t spend any money with them because they can’t gamble. Why Is UK Slot Games The Best Place To Play Rainbow Riches? With all the detail we’ve gone into, we hope you now feel like you know the Rainbow Riches family as well as you know your own! The original Rainbow Riches will always be the father of that family, and even if ten years from now it’s more like the family’s grandfather, we’re confident there will still be people playing it. If you’ve never played it before, we want you to play it here on ukslotgames.com. And if you have played it before, we want you to play it here on ukslotgames.com instead of where you’ve played it in the past! Here’s why you should do exactly that. First things first. If you join UK Slot Games, you have access to over six hundred online slots. That’s the sort of range that most slot game websites couldn’t even dream of reaching. We have variety, and you’re welcome sign up for free with no deposit required and browse our library. You might even get up to 500 free spins as a prize just for signing up! When you’ve found something you want to play, every time you deposit £20 or more you’ll earn more free spins. You keep using us, and we keep giving to you. That includes daily cash-back prizes of up to 10% on offer to our players. We believe that UK Slot Games is the best place to play online slots anywhere on the internet. We want you to believe that too, and so we strive to make sure that you’re happy and satisfied, and get everything you could ever hope for as a gamer from us. Every now and then, you might even find us offering Amazon vouchers and free pizza, and a Happy Hour during playing time. We believe great incentives and great service makes for a great place to play games, and we’d love to have you on board.